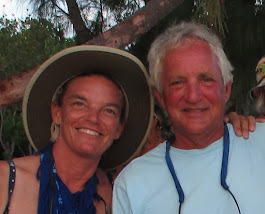 Unlike our trip south on the Intracoastal Waterway (ICW), in which we often did not plan around the tides, we traveled north with better planning. We rode the tide going through the inlets to help speed us along, and we started our day on a rising tide to reduce our chances of running aground. Layla has about a 6 ½ foot draft and we expected to encounter extreme shoaling to less than 5 feet in some areas. 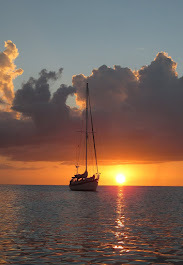 If we did run aground, we just waited for the tide to rise. 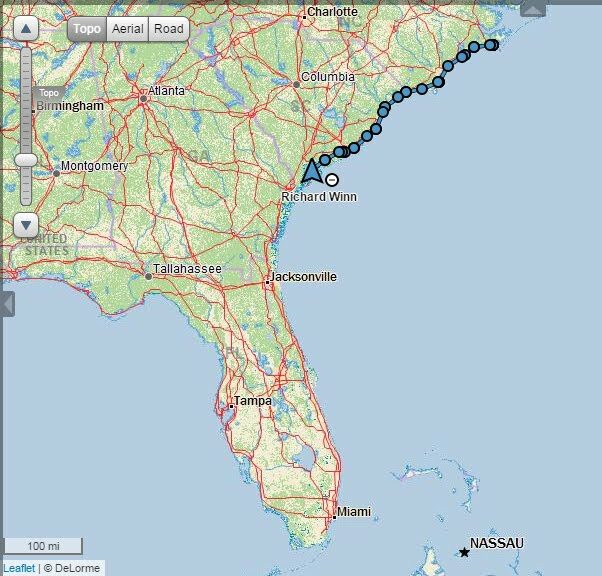 This planning was particularly important as we entered the notorious shallowest portion of the ICW in Georgia and South Carolina, which was made worse by the extreme low tides created by the supermoon. 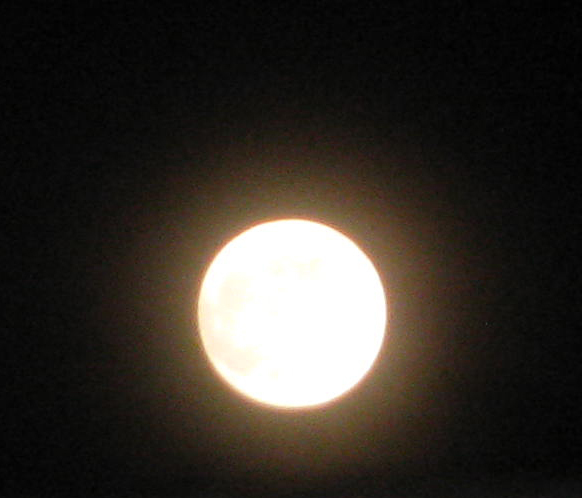 A supermoon occurs about every fourteen months, as the moon makes its closest approach to earth on its elliptical orbit. The shorter distance between the earth and the moon causes greater gravitational pull on the oceans and thereby creates extreme low and high tides. The super moon as seen from Layla's cockpit on a mooring in Saint Augustine, FL. Despite good planning, we did go aground on our voyage north. However, our track record improved dramatically compared to the trip south, as we only went aground twice, and only in locations technically outside of the primary ICW channel. On our second grounding we encountered shallow waters almost immediately as we raised the anchor. However, because we had left early on a rising tide, we only had to wait about a half hour for the tide to rise to set us free. 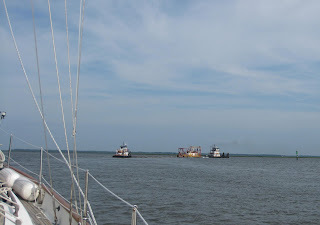 But to add drama, while we were waiting for the tide to rise, we saw a barge/dredge convoy approach us from behind. This convoy was massive, maybe two hundred feet long with four independent sections: a lead tug, followed by a dredge barge, followed by a long length of flexible dredge pipe, followed by the rear tug. We envisioned the worst as these vessels snaked through the same narrow channel. We contacted them by VHF, warned them of our limited maneuverability, and let them know that we had moved out of the center of the channel. After they passed, the tide rose to free us and we followed the barges through the rest of the river cut. This turned out to be the smart thing to do, as they warned us by VHF of other very shallow areas. Clearly their local knowledge was essential to carefully maneuvering through this cut. 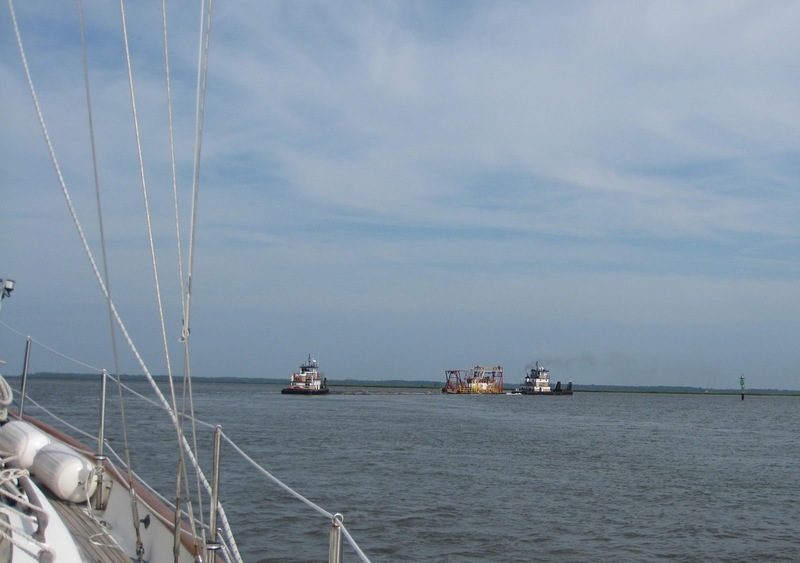 Our new traveling buddies: the barge/dredge convoy. The whole convoy was probably two hundred feet long, and required some special skills to snake the convoy through winding cuts like this one. This trip confirmed that far too often some charts aren’t up to date and that we had to be vigilant. When there were discrepancies between the chart and what we saw, it was often due to new markers being added or moved since the last update of some GPS software (sometimes as much as a hundred feet or more), leading us to doubt the dependability of much of the chart. Over the course of our ICW circumnavigation, we found the NOAA charts were almost always more accurate than the Garmin Blue Charts. This has served to remind us that navigation demands all the information that you can get, and most importantly, what you are actually seeing. We now use our Garmin Blue Charts for general planning and reference, and the NOAA charts for making definite navigating decisions.